Here's a few photos for all of you to tide yourselves over.....We'll put more up soon! Thanks for everyone who kept praying for us...this was definitly the hardest year of our lives. It's amazing how even after the worst year God will bless you with an amzing gift! I've never seen complete and pure joy on someones face until Ty walked in and saw his baby brother for the first time! He is the proudest big brother in the world! Well, it looks like we are going to get to see our new guy on Wednesday the 23rd. Our doctor and specialist said that if things are 'favorable' that at 37 weeks lets get that little guy out. Everything is looking great. We had our last ultrasound last wednesday and they estimated him to be at 5 lbs 13 oz. So we are thinking he'll be around 6 pounds on wed. Dr. checked me also on that day and said I was dilated to 2 and my cervix was soft. Which means I am favorable for induction. So we have an appointment wed at 9:00 to begin all the fun. We can always change our mind and wait a few days, but it didn't sound like they wanted us to wait too much longer. At this point it comes down to which risks you are willing to take. So, I'm sure we'll be there wednesday morning, ready or not. Wish us luck and prayers! 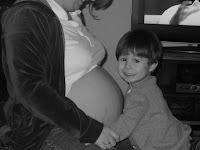 Here is a photo of Ty and his brother at 36 weeks! And, no, we really don't have a name yet...we are running out of time. Baby Update and New Art Project! Well, I am 34 weeks and had another ultrasound yesterday. They say the baby is around 5 pounds, huge to me! Dr. said that if my body is ready they will induce me at 37 weeks, which is only 3 weeks aways. If I'm not ready then we'll wait until 38 weeks! I'm still hoping that nature will not wait that long... misery is setting in. the whole no sleep thing is starting to wear on me. Everything else looks great with Baby, no we don't have a name yet, and he just keeps growing. More info later.... As for the photos, yes that really is my belly. Not knowing if we'll do this again I decided to let Ty finger paint my belly. I've never heard him 'giggle' like he did when he got to put paint on mommy's belly. Of course, he had to do his own also. Anyone out there preggo, I highly suggest this fun art project for your other kids, it's so much fun! Christmas at the Hirschenberger's was a little crazy this year....Ty, being almost 3, knew exactly what to do and what to expect. Most presents were met with the question, "I wonder what it could be? ", or " I can't believe Santa knew", or " Look what Santa's elves made me mom!". the things that came out of his mouth were priceless. And he was also very greatful to everyone and there came a hug and thank you with every present. It's great to know that we did teach him something good. Mom's house was crazy with 7 grandkids and tons of gifts, just think, next year there will be 8 of them. I hope you all had great holidays!